Are you ever in the mood to do something super unique and creative and it all goes awry? Yesterday was Sunday, so I thought I would get out some of my lace weight yarn and start a new, complex pattern for a shawl that I have been waiting to start. I got it out to wind it, and then this happened. So I decided to try something else with the remainder of the day and my dwindling patience. 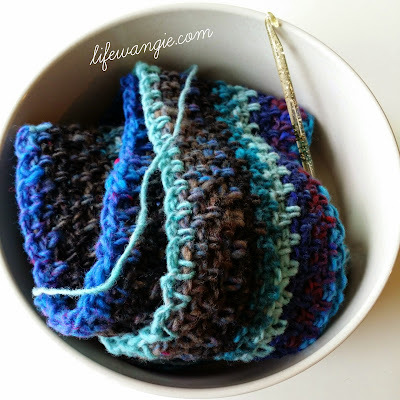 I had some Noro Kureyon that I got on a good deal on eBay and had no plans for, so I decided to make a little cowl. 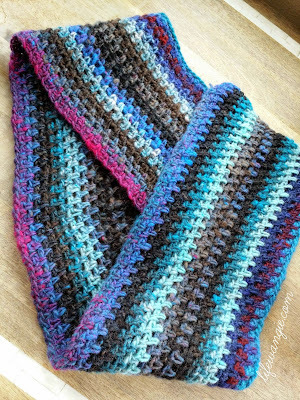 The full details about the yarn, pattern used etc are on my Ravelry project post. It was super easy. I was thinking Noro Kureyon would be a good purchase for a beginner crocheter who wanted to go outside the box a little on yarn choice. 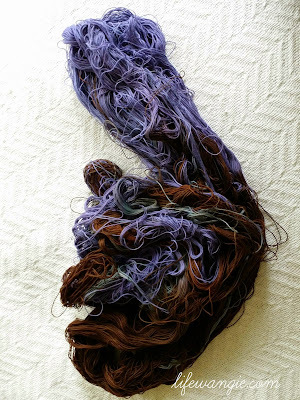 It's worsted weight, like so many of the big box craft store yarns, but it's 100% wool and the colors are so great. Including both knit and crochet, there are a whopping 46K projects on Ravelry (as of today) using it, so you could see a huge variety of ideas. I was also excited because this is the first project on which I have used my new glittery Addi hook. I'll admit I bought this hook just because it's glittery. I am swimming in crochet hooks, but ... GLITTER! It is nice and smooth and works nicely, and has no thumb grip, so it's good for entrelac. But mostly... GLITTER! It made me smile.